↑ Cloughley, Brian (2016). 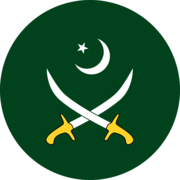 A History of the Pakistan Army: Wars and Insurrections (अंग्रेज़ी में) (1st संस्करण). London UK. : Skyhorse Publishing, Inc. आई॰ऍस॰बी॰ऍन॰ 9781631440397. अभिगमन तिथि 16 August 2017. ↑ "Country comparisons – commitments, force levels and economics". The Military Balance. International Institute of Strategic Studies. 115 (1): 486. 10 February 2015. आइ॰एस॰एस॰एन॰ 1479-9022. डीओआइ:10.1080/04597222.2015.996366. अभिगमन तिथि 28 September 2015. ↑ Article 245(1)–Article 245(4) Archived 21 मार्च 2015 at the वेबैक मशीन. in Chapter 2: Armed Forces in Part XII: Miscellaneous of Constitution of Pakistan. ↑ Harper, Stephen (2017). "The Bosnian War Goes to East: Identity and Internationalism in Alpha Bravo Charlie.". Screening Bosnia: Geopolitics, Gender and Nationalism in Film and Television Images of the 1992–95 War (google books) (अंग्रेज़ी में) (1st संस्करण). Indiana, U.S.: Bloomsbury Publishing USA. पृ॰ 155. आई॰ऍस॰बी॰ऍन॰ 9781623567071. अभिगमन तिथि 16 August 2017.